Hand feeding produces a very tame and sociable pet cockatiel. However, it's also an extremely time consuming and emotional process. Babies need to be fed during the day, when they are hungry and sometimes babies do not survive because of natural causes or mistakes made by the breeder. If you work or go to school, hand feeding is not advisable. The ideal situation, if you are considering raising hand fed chicks, is to be taught how to hand feed by your avian vet or by an experienced breeder, not by watching a video or by reading an article. Although not a complicated technique, hungry babies are impatient and they move quickly to get to the feeding syringe. The breeder must know exactly when, where and how much formula to feed a hungry baby. Chicks are usually removed from the nestbox and placed inside of a warm brooder at the age of 14 days for hand feeding the night before hand feeding starts. At this age the chicks will have pin feathers. Hand Feeding Hygiene Babies are born without a working immune system so they are more susceptible to getting bacterial or fungal infections from your hands, ordinary household objects and an environment that has been contaminated with disease causing organisms. 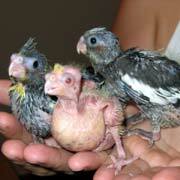 Always wash your hands with hot soapy water and use a hand sanitizer before making formula and before feeding chicks. Formula should be mixed in glass containers, not plastic. Plastic can have scratches which will harbor bacteria. Use sterile water or boil tap water for 10 minutes, before mixing into formula. Boiling will destroy bacteria and parasites that may be present in tap water. Make a fresh batch of formula for each feeding and fill all feeding syringes in advance. Throw out all leftover formula. Refrigerating formula does not prevent the growth of bacteria or mold on food. It only slows it down. Use a separate syringe for each baby and under no circumstances should a used syringe be dipped back into formula for a refill. This contaminates the entire batch and if one chick has an infection, all chicks eating from the container will get sick. After feeding the babies, wipe all of the excess formula off of their beaks, skin and feathers with warm water and a large gauze pad. Take a Q-Tip with sterile warm water and gently wipe out the inside of each baby's mouth after feeding or give the babies a few drops of sterile warm water inside of their mouths. This will clean out excess formula and help prevent bacteria or yeast from forming. Disinfect all syringes, spoons and formula dishes after each feeding with a disinfectant that is recommended by your avian vet. Some breeders use Grapefruit Seed Extract, (Citricidal) a non-toxic, product for sterilizing. Harold Voren, world renown breeder of parrots, states that an old fashioned baby bottle sterilizer can be used as a non-toxic way of sterilizing. 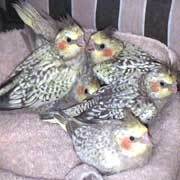 Your avian veterinarian can recommend other safe and effective products for sterilizing. Crop Burn: Crop burn is the scalding of a chick's crop and esophagus with formula that is too hot. Severe burns can result from a single feeding, or from repeated exposure to food that is slightly hot, (over 108 degrees F). Birds will eagerly accept hot food and you may not recognize crop burn for days to weeks after it has occurred. If one bird in your nursery has crop burn, all of the others in the clutch should be examined carefully to see if they have been injured too. A crop burn is excruciatingly painful for a chick and it can cause death either from the burn itself, or from shock. Imagine how it would feel if you swallowed a bowl of hot oatmeal, right out of the pot. When a baby's crop is burned, the skin will turn red and if the burn is severe, blisters that turn into scabs will form on the skin. When the wound start oozing liquid and the scab falls off, there may be an actual hole exposing the crop. The temperature of formula should be between 104 and 106 degrees Fahrenheit to prevent crop burn and to facilitate proper draining of the crop. Crop burn is 100% preventable if you use a digital candy food thermometer instead of your wrist to determine temperature. Heating in the microwave can also cause crop burn because scalding hot spots can be left in the formula even after stirring. Heat formula in glass containers in a pan of boiling water or on a hotplate. To mix formula, heat water first and pour into dry formula, instead of heating pre-mixed formula. By the time you are finished stirring it into dry formula, it will cool down to 104-106 degrees F. Check again with digital thermometer. If the temperature of formula is just a few degrees higher it will burn the baby's crop. A few degrees lower and the baby's crop will not drain. 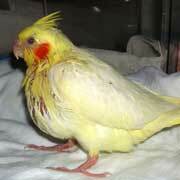 If your do burn your baby's crop, this is a medical emergency that requires immediate attention from your avian vet. Medicine will be needed to prevent infection and in some cases, surgery to close the burn hole. As with any serious injury, your baby may also go into shock. Shock, if left untreated, results in death. 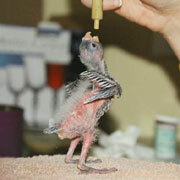 Aspiration If a baby bird inhales formula into the trachea or lungs while being handfed, it is said to have aspirated. Under normal feeding conditions, a bird's trachea is closed by the glottis, to prevent the inhalation of formula or fluid. Aspiration usually occurs when babies are reluctant to accept hand feeding formula or when a breeder dispenses formula before the chick is giving a feeding response, (neck bobs up and down rapidly). Other causes include feeding a chick too slowly, giving chicks the wrong amount of formula, overfeeding a baby that has a full crop and formula that is too thin. When a large amount of formula is inhaled into the trachea or lungs, the baby will start to shake its head and gasp for air. Chicks inhaling a large amount of formula into the lungs usually die from asphyxiation immediately (suffocation). If a smaller amount of formula is inhaled, chicks may cough, sneeze and fluid may come out of the nostrils. If the baby is able to expel inhaled formula, it may still be prone to getting a bacterial or fungal infections of the crop or respiratory system months later. Formula that backs up into nares can cause a clogs. Your avian vet can remove clogs from nares manually then gently flush them with a saline solution. Your bird will also be treated with antibiotics to prevent a microbial infection of the upper respiratory tract. Aspirated chick may not show any symptoms of respiratory problems at all: labored breathing, breathing with mouth open, wheezing, breathing with a raspy or clicking sound and tail bobbing. Weight gain will be poor and the baby will develop a chronic fungal infection or pneumonia at a later date. If one of your chicks has aspirated take it to an avian veterinarian immediately. Aerophagia:Bubbles or filling of the crop with air is usually caused by a hungry chick gulping and ingesting air at the same time it ingests, (swallows) food. It's not the same condition as subcutaneous emphysema, in the above picture. Aerophagia occurs most often with stunted chicks that beg constantly for food. The hand feeder, dispensing formula too slowly from the syringe, is another contributing factor because the chick gulps the formula faster than it is being provided. Feeding formula at a steady rate will correct the problem in most cases. The ingested air can also be gently "burped" or massaged out, feeding the chick immediately afterwards before it can gulp more air. In some cases, it may be necessary to tube feed chicks prone to ingesting. Sour Crop:A healthy chick's crop should empty completely at least once every 24 hours. When food does not traveling down from the crop to the stomach and other parts of a bird's digestive system as it should, it goes sour and starts to ferment. Sour Crop is the term used to describe the accumulation of undigested, fermenting food in a chick's crop. Sour crop causes impactions, total shut down of the digestive system as well as infections. Causes of sour crop include not letting the crop empty once in a 24 hour period, diseases, bacteria, yeast and fungal infections, improper preparation or temperature of the formula, (too cold, too thick) a brooder that isn't warm enough, babies getting chilled when out of the brooder, babies ingesting wood, liter, corncob, walnut shell type beddings and a breeder who overfeeds the babies and stretches out the crop. As formula from additional feedings builds up inside of a stretched crop, the capacity to hold more sour food increases. Crop muscle tone becomes weak and food can no longer be pushed down into the baby's stomach. If sour crop isn't treated in the early stages, the chick's entire digestive tract will slow down or shut down completely, depriving the baby of nutrients and fluids. Secondary infections will also develop until death finally occurs. Some breeders add a FEW drops of apple cider vinegar, papaya extract or half baby food applesauce to half of the mixed formula for the morning feedings. These products are used to help the crop drain and to prevent sour crop. Formula should also be 104-106 degrees Fahrenheit. Lower temperatures will contribute to the development of sour crop by chilling the baby. If you baby's crop isn't draining properly, call an avian vet. Crop Stasis (Slow Gut Statis: Slow Crop in the advanced stages is known as Crop Stasis or Slow Gut Statis, Although the 2 terms are used interchangeably and the causes are the same, SGS is the total shut down of the baby's entire digestive tract not just the crop. The crop is so impacted with hardened, fermenting matter, that now the entire digestive tract is being affected, either slowing down significantly or shutting down completely. Babies with SGS are being deprived of nourishment and fluids. Death from starvation and complications from a yeast or other fungus or bacterial infection will develop if left untreated This is a medical emergency because chicks are born without any working immune system to fight infections. The chick needs to have the contents of the crop removed, antibiotics administered and supportive care from an avian vet. It's very important that you seek treatment from an avian vet. He/she will flush the crop with a sterile solution to break up the impacted matter. The procedure may have to be performed several times. Your avian vet will also administer digestive enzymes, fluid for dehydration, antibiotics and anti-fungal medications to prevent or treat infections. Experienced breeders know how to empty a crop manually by using warm Pedialyte, a gentle massage to break up the impaction, then suctioning out the contents with a syringe or similar instrument. 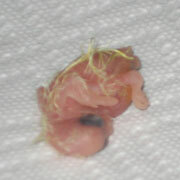 However, the baby should still be evaluated afterwards by an avian vet. If your baby is having problems, please call an avian vet. Bordatella Also known as "Lock Jaw" is a severe respiratory disease that has a devastating effect on a chick's ability to eat. Chicks that become infected with Bordatella avium bacteria are not able to open their beaks for parental feedings or hand feedings the way the baby in this photo is doing. A breeder may think that the parents have abandoned the baby or that they themselves are doing something wrong during hand feeding. According to Dr. Susan Clubb, a board certified avian vet, the mode of transmission is from parent to chick or from chick to chick in a nursery. Dr. Clubb also states that "Bordatella avium bacteria invades a bird's respiratory system from the sinuses into the muscles of jaw, resulting in the chick having a "lock jaw". 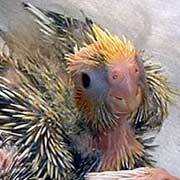 Adult birds, especially cockatiels, can be asymptomatic carriers, with no visual symptoms present. Clinical symptoms besides the classic "locked law" include a nasal discharge and glassy eyes. There is no successful treatment for Bordatella yet, since response to antibiotics is poor. Babies will die from starvation or from the infection itself. Humane euthanasia is often recommended, to relieve a chick from the obvious pain and suffering associated with the illness. Candidiasis and Yeast Infections Candida is a yeast that is found in the environment as well as in the digestive tract of birds. Normally yeast does not cause a problem unless a bird's natural immunity has been impaired, permitting the fungi to flourish. Candida can cause illness in baby birds that are being handfed, due to their weak immune system or babies that are on antibiotics. The illness can affect adult birds with weak immune systems from malnutrition, environmental or physical stress or recent treatment with antibiotics. Although yeast infections will primarily affect the crop, they can invade the entire digestive system, respiratory system, central nervous system as well as all other organs in a bird's body. Causes include improper hygiene, not washing hands, not cleaning or improper cleaning of brooders, cages, food and water dishes, not sterilizing hand feeding equipment and leaving fresh foods in a bird's cage for long periods of time. Symptoms include: White plaques in the mouth, thick dark areas in the corners of the mouth, weight loss, bulky stools, regurgitation, the crop emptying slowly or not at all or a swollen, mucus-filled crop. Feather problems around the crop due to irritation and beak abnormalities due to chronic infection may also be present. Sometimes a sour smell can be detected from a bird's mouth. The best way to prevent yeast infections from invading your nursery is to maintain proper hygiene and sanitation in cages, brooders, food/water dishes and when handling or feeding all birds, both babies and adults. Aspergillosis :Aspergillosis is a fungal disease that affects the respiratory system and eyes. The disease is associated with damp, dirty, nestboxes and brooders that and those that contain organic bedding materials. Asperfillosis is caused by common environmental mold spores that are found everywhere in the environment. Mold will flourish in any damp, dark place both inside and outside of the home. Using organic material for the bottom of brooders, nestboxes and cages (any type of liter, wood shavings, corn cob bedding, walnut shells, rabbit pellets), not cleaning brooders and cages will promote the growth of aspergillus and other molds. As mold spores multiply rapidly, many of them will produce an excessive amount of toxins that will contaminate the breathing air around chicks, making them sick. Baby birds that do not have any working immune system and adult birds with an already weak immune system from breeding are at a high risk for getting the disease. Adult birds suffering from malnutrition, environmental stresses (breeding pairs) or adults recently on antibiotics, will have weak immune systems to and are also at a high risk for getting sick . According to Dr. Susan Clubb, the mode of transmission is the inhalation of mold spores by birds. Symptoms of Aspergillosis include inactivity, depression, emaciation and in severe cases, respiratory symptoms: difficult, labored breathing, breathing with an open beak, tail bobbing and or a change or loss of vocal ability. Aspergillosis can not be transmitted from bird to bird or from bird to human. Crop Impactions: Another problem indirectly associated with hand feeding is the use of improper nesting material for the bottom of the brooder. Nesting materials are often ingested by chicks when they start to forage for food. Some types of bedding materials are not digestible, causing digestive impactions if swallowed by chicks. Wrong types of nesting materials include: any type of liter, corncob bedding, or walnut shells, any type of wood chips or wood shavings, pine, aspen, cedar etc. The lutino chick in this photo has a digestive impaction from ingesting aspen shavings. Some impactions can be treated by avian vets with digestive enzymes and antibiotics. Other impactions require surgical removal or they can cause death.. The use of pine, cedar, aspen or other wood chips/shavings should also be avoided. Cedar is toxic and the fumes and dust from other wood type bedding materials contain fumes and dust that will irritate a bird's eyes and respiratory system. Crop Emptying too Fast: infection, too much water in formula, inadequate food volume. Chick Not Growing: Infection, malnutrition, inadequate food intake, chick too cold, chick too hot, congenital abnormality, incubation problem, parasites. Chick Vomiting: Normal crop shrinking at weaning, food too hot or cold, over feeding, infection, gout- kidney disease from dehydration, malnutrition, toxins (aflatoxins, heavy metals), congenital disorder, genetic disorder, vitamin D3 toxicity, polyoma infection, foreign body ingestion. Chick Won't Eat: Food too hot or cold, overfeeding, chick stressed or frightened, chick ready to wean, chick doesn't like taste of food, bordatella (lockjaw), blindness. Chick Begs Excessively: Malnutrition, infection, inadequate feeding volume or frequency, watery formula, kidney disease, too many daylight hours, (chicks need 12 hours of darkness). Chick too Thin: Malnutrition, inadequate food volume, inadequate feeding frequency. Stunted Growth, Failure to Thrive: Malnutrition, inadequate caloric intake, infection, temperature too low or high, environmental contamination of water, poor utensil or hand hygiene, poor food storage, airborne contaminants, congenital problems, incubation problems, weak hatch, genetic incompatibility of parents, toxicity from disinfectants, excessive additions to formula. Chick too Fat: Food too high in calories, excessive volume or frequency of feeding for age, fatty liver disease. Crop Feels Thick and Doughy: Candidiasis, (yeast infection) dehydration, crop statis, crop or pharyngeal puncture. Air in Crop: Air gulping, slow feeding, swallowing air with food, forcing air into crop with syringe, fermentation of food in crop. Ballooning of Air Under Skin: Subcutaneous emphysema, distention of cervicocephalic air sac, air gulping, swallowing air during or after feeding, dribble feeding, fermentation of food in crop producing gas. Regurgitation and Vomiting: Unless regurgitation is slight, occurring during the peak weaning period, it's abnormal. Possible causes, crop infections, (bacterial, fungal or both) formula too hot or cold, brooder too hot, over filling the crop with too much formula. I hope this page has convinced those who want to purchase unweaned birds and hand feed them, not to do it. If you are not experienced, you can inflict cruel and agonizing pain on a baby bird and you can torture a chick to death. 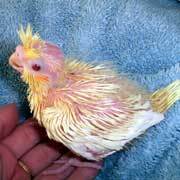 Please, don't ever do this to a baby cockatiel. Please buy your bird fully weaned, and if you plan on breeding, read books, talk to breeders, your avian veterinarian and seek training in hand-feeding before you start. Special Thanks to all who shared photos of their babies with us!